A Columbo blog would be a feeble spectacle without some measured analysis and critique of the show’s 69 episodes. Over the course of the coming months (and years) I’ll be offering my thoughts on every Columbo episode: the brilliant, the good, the average, and the very rare stinkers. I’ll be keeping it simple, providing a brief synopsis, plus my take on the single best moment and the episode as a whole. I don’t pretend to be a great critic, or an authority on classic TV. I just love Columbo, and hope you’ll enjoy reading my opinions, and sharing your own. I’ll be chronicling the episodes in order, so today we’re rolling back the clocks to February 20, 1968 and that seminal slice of TV history – Prescription: Murder. In order to keep hold of his her fortune, the super suave and highly intelligent Dr Ray Flemming brutally strangles his wife, Carol, at their luxury penthouse and stages an elaborate charade with his beautiful young lover, actress Joan Hudson, to establish his alibi. In a damning indictment of 1960s airport security measures, Joan disguises herself as Carol (despite being young enough to be her daughter), and flounces off a pre-flight airplane after a staged argument with Dr Flemming – leaving the good Doctor to fly off to Acapulco to seal what looks to be an airtight alibi. It isn’t long before little things start bothering Columbo. Why didn’t Dr Flemming call out to his wife when he got home to see where she was? Why was his luggage so overweight when he checked it in at the airport, and much lighter on the way home? What happened to the items supposedly stolen from the Flemmings’ home? What happened to Mrs Flemming’s dress and gloves? And what’s the story with Joan and Dr Flemming? With regard to the latter, he quickly establishes it’s more than a Doctor-patient relationship. Although Dr Flemming predictably has an answer for everything, in a foreshadowing of the deductive powers he will show in the series proper, Columbo pieces the crime together. He comes to the realisation that the Dr is just too assured and too in control to crack. Joan, on the other hand, is a different matter. She’s the weak link, and he sets out to break her, leading to a memorable showdown at the movie studio where Columbo lays down the law and lets Joan know that he’ll keep hounding her until she confesses her part in the crime. Although Joan weathers the storm (just), she’s shaken beyond the point of return. She rings Dr Flemming in rising panic, but he tells her to cool it and ride it out. But the next day Columbo calls the Doc to Joan’s house and reveals she’s died from an overdose. Upon seeing a bikini-clad redhead being dragged from a swimming pool and covered with a blanket, seemingly dead as a post, it looks for all the world as if Dr Flemming is home and dry – his last link to the crime a thing of the past. You got rid of your wife but you’ve lost the girl you loved, so it was all for nothing, chides Columbo. Not really, scoffs the dastardly Doc, unable to resist one last chance to prove his superior mental capacity. Joan was expendable. He’d have found some way to get rid of her. Lo-and-behold the real Joan emerges from where she’d been skulking, listening to every back-stabbing word. The other redhead was a decoy – Columbo having used Dr Flemming’s own airplane modus operandi against him to make him see what he wanted to see. It has to be the ‘hypothetical’ conversation about the crime between Columbo and Dr Flemming over bourbon in the Doctor’s office. Adopting the ‘You know I did it; I know you know I did it; but you’ll still never catch me’ approach, Flemming oozes arrogant self-assuredness as the two men mentally size each other up. With such conversational gems as Flemming telling Columbo he’s “a sly little elf”, it’s a scene boasting great writing and fine performances from the contrasting leads. Remind yourself of the brilliance below. As a stand-alone piece of television, Prescription: Murder takes quite some beating. It’s effortlessly stylish from the Rorshach test-inspired opening credits, to the satisfying conclusion set inside the iconic Stahl House, and everything in between. It very ably captures the Flemmings’ wealth and exclusive lifestyle and is a magnificent slice of late 1960s opulence. Gene Barry remains among the quintessential Columbo killers, bringing a diabolical assurity to the role of Dr Flemming that the likes of Jack Cassidy would owe much to in the 70s’ run. And while the rest of the supporting cast is also first rate, with the beautiful Katherine Justice excellent in bringing to life Joan’s dependence and fragility, this really is all about Falk and Barry, who dazzle in every scene. The mental jousting in evidence here between the two is oft-emulated but never bettered across the show’s 35-year life span. Dr Flemming thinks he’s absolutely got Columbo’s measure. And on the surface he has. He’s shrewd enough to recognise that the Lieutenant pretends to be less than he is in order to be underestimated to catch out his prey. Of course Dr Flemming, having identified these traits, will be far too clever to fall for Columbo’s tricks, won’t he? For even though he respects the Lieutenant’s talents, even thought he can see the danger signs, the higher intellectual plane Flemming operates on is sure to see him smugly best his police opponent. Wrong. Despite his absolute confidence in beating the rap, Flemming still succumbs, deliciously, when Columbo outmanoeuvres him at episode’s end. His downfall will cast a long shadow over the series (think how many future murderers will make the mistake of thinking they’re superior to Columbo, only to be outsmarted), and again will rarely be bettered. Yes, when Prescription: Murder is good it’s very, very good. But a view I’ve long held – to some Columbo fans a controversial one – is that I would love to have seen this episode remade when Peter Falk was completely at home with the character. Don’t get me wrong – I do love this episode and value what it represents. But this isn’t the Columbo we know and love. Indeed he’s a very different character here, being less self-deprecating, more openly knowing and shrewd from the start, as well as more direct and confrontational. There are shades of what the character will become – but that’s all. And that’s understandable, for this wasn’t even really a pilot episode in the normal sense. It was a one-off mystery, based on an earlier stage show version, with no expectation that it would ever be turned into a serial, and no reason to believe that Falk would make the character one of the most enduring and popular in TV history. While we have to respect his abilities, and nod appreciatively when he out-flanks and out-thinks Dr Flemming, could we have loved the Columbo we see in Prescription: Murder? I think not. It’s only later, when Falk had redefined the character, filling him with charm and idiosyncrasies, that we can truly love him. Prescription: Murder‘s stage show roots, a strength in some areas, are a weakness in others. Is it just me, or are some of the lines delivered in a rushed and booming theatrical fashion? At times I feel like scenes were done breathlessly, in one take. I have no proof of it, but I suspect Falk – known for his love of multiple takes, which caused frequent filming over-runs in the 1970s – raced through some of these scenes far more quickly than he would in later outings, when he was in total control of every nuance of the character. Still, even if all this is merely an exploratory step towards the establishment of an iconic character, it’s still essential viewing. Take Prescription: Murder for what it is and you have a brilliantly crafted mystery, a supremely suave baddie, and a smart lawman who gets inside the head of his quarry and beats him at his own game – vital ingredients for the success story the show would become. And who can complain about that? Before it reached television screens, a stage show of Prescription: Murder had toured the US for 25 weeks in early-to-mid 1962. Written by Levinson and Link, and based on an earlier TV mystery they’d created called ‘Enough Rope’, Prescription: Murder the play starred Oscar-winning actor Thomas Mitchell as Lieutenant Columbo. It was, alas, one of his final roles, as Mitchell died in December 1962. Dirk Benedict (aka ‘Face’ in the A-Team) would play the role of Columbo when the stage show was resurrected in 2010. Do let me know what you make of my review – and what your own thoughts are on the episode. I’d love to hear from you, as I know this remains a real fans’ favourite. And thanks as ever for reading. Look out for a review of Ransom for a Dead Man coming soon! Read my top 5 Prescription: Murder moments here. Read about the origin of Prescription: Murder and the Columbo character here. What’s your favourite Columbo episode? Have your say in the Columbo best episode poll here. Tags: Carol Flemming, Columbo, Gene Barry, Joan Hudson, Katherine Justice, Lieutenant Columbo, Peter Falk, Prescription: Murder, Ray Fleming, Ray Flemming, Richard Levinson, Thomas Mitchell, William Link. Bookmark the permalink. Just completed this episode with the very young looking short haired Peter Falk and am totally in agreement with Columbophile. Every scene, as well as the flow, pacing, performances, and interactions of Falk and Barry are wonderful. My only complaint is how un-Columbolike Falk’s dressing down of Miss Hudson was. He was strident, and even maybe mean. But then he sympathetically puts his arm around the shocked and suffering Hudson, almost in apology. Although this scene is necessary to the plot, it (as well as a few other interactions) so us a Columbo nothing like the more quiet gentle spirit we’ve come to love. Yes, Columbophile, you are right on. Something that has always puzzled me about Prescription Murder is the “mystery of the moving telephone”. In the first act, great emphasis is placed on the telephone on the bar. It rings during the murder and Fleming then makes out to the caller that his wife is still alive. Joan then uses the phone and pretends to be Mrs Fleming when she calls the dry cleaners. As Fleming and Joan leave, we see that the cloth she used to avoid leaving fingerprints has been left on the telephone, but then Fleming retrieves it and puts it in his breast pocket. In the second act, when Fleming returns from vacation to “discover” the apparent break-in and murder, the telephone has been moved to the coffee table in the middle of the room! And Fleming doesn’t even notice! Neither Ray or Joan could not have moved it and the “burglar” doesn’t exist. I suppose that Columbo and his men could have moved it, but what would be the point? There would not be two telephones so close to each other in the same room, so is this the first Columbo goof? In this episode Dr. Flemming and his wife lived in a penthouse apartment. That apartment would have been several stories up. How was the supposed killer able to enter the apartment thru the patio door? Dr Fleming’s Frederick the Great lawn jockey (in his office) is one of the coolest props I’ve ever seen. Wish I had one! Do you consider this an actual episode or a made for TV movie that’s included in the box set? It’s very much a made-for-TV movie at this stage. That’s all they were looking for at the time. I noticed that the shagpile rug in the bathroom here (so hygienic!) was the same one used in Death Lends A Hand, when the murderer was searching for the ‘lost’ contact lens. Perhaps it was corrugorating! love the music at the start and I love the scene where Colombo interrogates Mrs Hudson in the studios very moving great acting , prescription murder is certainly in my top 20 , I always enjoy it. That the penthouse apartment was robbed by going in through the patio doors really isn’t pointed out by Columbo, let alone the rank n’ file police. It’s still a really good story, even if Columbo comes across as somewhat creepy and mildly abusive of his position. Love this website. And this review. 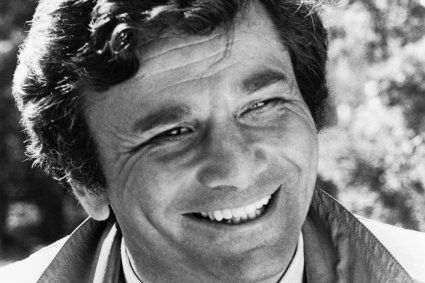 In demeanor, Falk’s approach here is more closely akin to the policeman he played in “Penelope.” That cop says out loud what Columbo never would: “The guilty suspect’s coolness is what ultimately trips them up.” Columbo in “Ransom” has the inquisitive, faux-confused brow that would play thereafter.